Ask fellow campers about "Destin RV Beach Resort" and nearby attractions. This is a very small but nice RV park located in Miramar Beach next to Destin. Price is very high but this is a resort area and park is located just 1 1/2 blocks from the beautiful beach. Park sites are all back-ins with level concrete pads and patio with concrete table/benches. Road through park is made of very attractive bricks. Sites are wider than most parks with nice well maintained privacy shrubbery, mulched area and palm/crape myrtle trees between the lots. There is some small grass area area in the front of each site. There is a security gate closed at night at the entrance but the damaged exit gate was open all the time. There is a small pool. We could get satellite access. Only issues were the wifi is very poor and sites are not very long so larger rigs have to park your tow vehicle perpendicular to RV and drive across the grass area. Also more generally be aware the traffic in/to the Fort Walton and Destin area is very heavy in summer so plan on a lot of extra time to get to this park (avoid Old Hyw 98) or traveling around area. Evidentially Florida allows beaches in front of condo/hotels to be private so public areas and access is very restricted and crowded. We camped at Destin RV Beach Resort in a Motorhome. We have stayed at this park in August for a number of years. This year, we found a much higher than normal level of irritants and they detracted significantly from our very expensive experience: * Sites are extremely difficult to get into * The foliage is not well trimmed. Every time I come to this place, I have to cut back foliage (although it is supposedly against the rules) to prevent it from rubbing my coach and providing an entry path for ants and other insects not to mention the residue deposited on the top of the coach and the slide outs. * The TV Cable did not work for most of the stay. The office reported that it had been out four times in a month and provider did not seem to be capable of getting it fixed. * The swimming pool had been contaminated and was useless for the majority of our stay * The wireless internet is a cruel joke. <1MBPS of speed. Due to low Verizon signal strength, the mobile hot spot was not much better. Do not even think of coming to this place if you need or intend to get any business done that requires internet service. It is hard to state how irritating and handicapping the lousy wireless service is in this place. * The park charges $2.50/day over the quoted rate for an 'electricity surcharge.' Surcharge? Most RVs would not use $2.50/day of electricity in total. This is nothing but a way to be disingenuous about what is being charged for a site until you arrive and find out you are paying for add-ones that were not previously disclosed. This is dishonest. I have never paid an electricity surcharge. It's not the $2.50. It's the principle behind this behavior. * Upon check-in you get an 8 panel brochure from Walton County. Six of the eight panels tell you what you cannot do in Walton County. 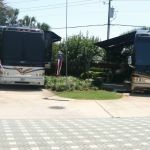 * The office staff can be very hostile but they are clearly not responsible for the many shortcomings of what was once a very nice park I'm done with the Destin RV "Resort" We camped at Destin RV Beach Resort in a Fifth Wheel. This was our first stay at Destin Rv Beach Resort. It will not be our last. In fact, upon leaving, we booked again in April. Without question, this is the nicest Rv park at which we have ever stayed and is and easy "10" rating for me. This is a small, gated and intimate park with just over 30 sites. Private beach access is provided a few hundred feet from the park at the location of a very nice beach-side restaurant, the "Surf Hut." The cobblestone entry streets are wide and allow easy access to the park sites. The location is geographically perfect for excursions in and around Destin, Seaside, Grayton Beach, Ft. Walton and other near-by places. The Rv sites are very large and the grounds are immaculately landscaped and manicured, promoting an incredibly private, lush and tropical setting. The landscaping between the sites also provides site privacy. In fact, I didn't even know my neighbor was there. The bathrooms/showers were very well maintained. WIFI was adequate. And last but not least, I can't say enough about Mike and Rita at the front desk. They were most engaging, accommodating and helpful. IMO, if you don't like this place you don't like Christmas! It's that good! We camped at Destin RV Beach Resort in a Travel Trailer. We were only there for a couple of nights, but its a very well kept park. Nicely landscaped. Easy beach access and a good restaurant, the Surf Hut, an easy walk across the street. The sites are a bit tight, but manageable. Our Class A is 37 ft with 3 slides and it fit. Was able to extend all slides and the awning. The concrete pad was perfectly level! Only had to seat the jacks to stabilize the coach. Its a gated area, so felt pretty secure. Also had a nice swimming pool area for the guests. We would definitely stay there again if in the area. We did not have a toad, so can't answer those questions. Cable hook up was also provided. They also have WiFi, but we really weren't able to get it to hook up. Minor inconvenience for a couple of nights. We camped at Destin RV Beach Resort in a Motorhome. The Surf Hut restaurant is really good. Reasonably priced for the area. When staying here, you receive a discount on chair and umbrella rental on the beach. Wonderful park with easy beach access. We've VRBO both Miramar and Seaside for the last 5 years with our family spring break. With the kids off in college this year we decided to sneak down for an adult spring break. What a great time. Surrounded by Prevost, Newmar, Entegra, Super C's and the finest 5th wheel rigs we were a little out of our league with a 33' keystone. No matter, everyone was very helpful with our late arrival in a pouring rain. This property is managed by the same family that owns Days Inn next door. This group also owns beach frontage just left of the Surf Hut allowing for private access and a discount on chair and umbrella rentals. We soon learned drive over and park in the Surf Hut parking lot next to the private entrance. 10 steps up and 10 steps down to a rented chair and enjoy a cold drink and powder sand. Seriously, 10/10. We camped at Destin RV Beach Resort in a Travel Trailer. Walk to the Surf Hut FTW! Always enjoyed Pompano Joe's with our past visits but Surf Hut wins for both food and location. Joe's Crab Shack for all you can eat crab legs (bring cash and expect a 1 hour + wait). Doughnut Hole for breakfast (another hour in line but worth the wait). Drop off your spouse when passing the front door, line to the right is for walk up doughnuts, line to the left is sit down. Super clean, great landscaping, and close to the beach without getting sand inside the RV. Great folks at the front desk. Helpful. Courteous. Pleasant. Some large sites (12 and 13) and some smaller sites. Will visit again. We camped at Destin RV Beach Resort in a Motorhome. Very nice small, quite park. Great location. Site was a little small for 43 ft. motorhome, but worked. Lots of landscaping on sites gives lots of privacy, but makes it inconvenient for door access on motorhomes. I have satellite dish and had no problem with reception. Excellent cable and WiFi. We camped at Destin RV Beach Resort in a Motorhome. We recently stayed at this campground while on vacation in Destin, Florida. I'm not sure what classifies this campground as a "resort," but it is definitely in a good location close to the beach. The sites had concrete pads and were nicely landscaped to create privacy. The bathrooms were clean, although there is only one toilet in the men's bathroom. The pool is nice, but the light wasn't working which made it hard for kids to swim after dark. The so-called "private" gated entrance to the beach was broken the entire time we were there, essentially allowing anyone access to that area of the beach. There was also a gated entrance to the campground which was left open during the day. I was repeatedly approached by shady employees of an RV washing business trying to sell me their services. There was also a rundown ice cream truck that made repeated passes through the campground. At a cost of $90.00 per night, I don't think I would stay here again. We camped at Destin RV Beach Resort in a Travel Trailer. Vegetation not trimmed. You will have to break off limbs to keep from damaging your coach. The wireless service is a joke. You are lucky to get 0.75 MBPS of download speed which is good for nothing. The wireless phone service is not much better so a wireless hotspot is marginal at best. The close proximity to the street the fire department uses to run in and out is exciting when sirens wake you at 3 AM. Otherwise the place is fairly quiet and the sites are relatively private even given their close proximity to each other. We camped at Destin RV Beach Resort in a Fifth Wheel. Wonderful hidden GEM across from beautiful Miramar Beach. Beautiful emerald green/blue clear water and white sandy beaches. Professional and friendly Check-In. The park is very clean with only 36 sites. The resort loop is all pavers with very nice landscaping. Restrooms and Laundry very clean. Pool is great but some lounge chairs need to be replaced. There’s not a lot of additional parking. Backing-in your coach can be difficult when the park is full, just take your time. Ocean beach access is across the street and up some stairs over the sand dunes. We recommend going down the street to "The Whales Tail Restaurant" and walk onto the beach with no problems. The "Whales Tail" also has a beach bar and bathrooms on the beach. Street side parking is free. The resort location is central to everything the area has to offer. Car rental is walking distance from the resort and tons of great area restaurants to try. Would definitely stay here again and again ! . We camped at Destin RV Beach Resort in a Motorhome. Very nice landscaping. Pool is great. Restrooms very clean. Short walk to beach access. Bike/ walking trail that is on the road in front of the campground is great. Love the size of the campground. Close to everything. We camped at Destin RV Beach Resort in a Motorhome. Pricey for a ho hum park. Nice landscaping. Pool needs face lift and upgrade on patio furniture. Nice location but beach not close enough to walk too when taking accessories. Gated, yet front gate remains open all day long(?). Tight spaces. We camped at Destin RV Beach Resort in a Motorhome. Extremely nice park. Exquisitely landscaped and maintained. The main complaint we have is that the sites are very compressed. There is barely room for a RV and a tow vehicle or dinghy. The staff is very cordial and helpful. The place is relatively expensive but better than hotel options. We have stayed here before and would return. We camped at Destin RV Beach Resort in a Fifth Wheel. Are you affiliated with Destin RV Beach Resort ?